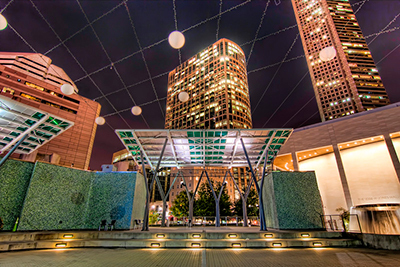 Located in the heart of the Theater District, Jones Plaza has a long history as downtown Houston's outdoor centerpiece, dating to its construction in 1966. 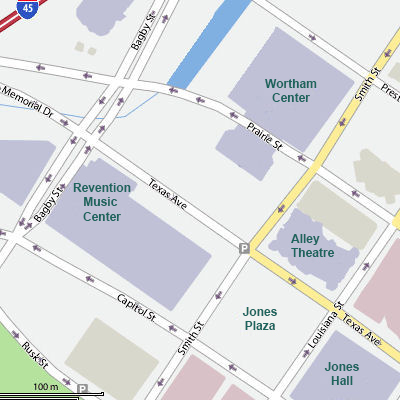 The plaza, one block square across the streets from both Jones Hall and Alley Theatre in the heart of the Theater District, is bounded on the north and south by Texas and Capitol Avenues and on the east and west by Louisiana and Smith Streets. Recent renovations added features such as pedestrian ramps, a permanent stage, concession facilities and restrooms. Visitors can enjoy five shade-providing canopies, a fountain and Mexican sycamore trees. The principal feature of the makeover is the lowered elevation that places the main area of the plaza at street level. The improvements include the installation of pedestrian ramps, permanent staging, Plaza Bistro and restrooms.